Evidence-based practices and resources lead to quality care and better health for patients. For that reason, CHI Saint Joseph Health Partners publishes two reference tools for our providers and care coordinators: Quality Matters and Documentation Tips. These tools provide important reminders and easy to follow tips for patients encounters and document of provider care. 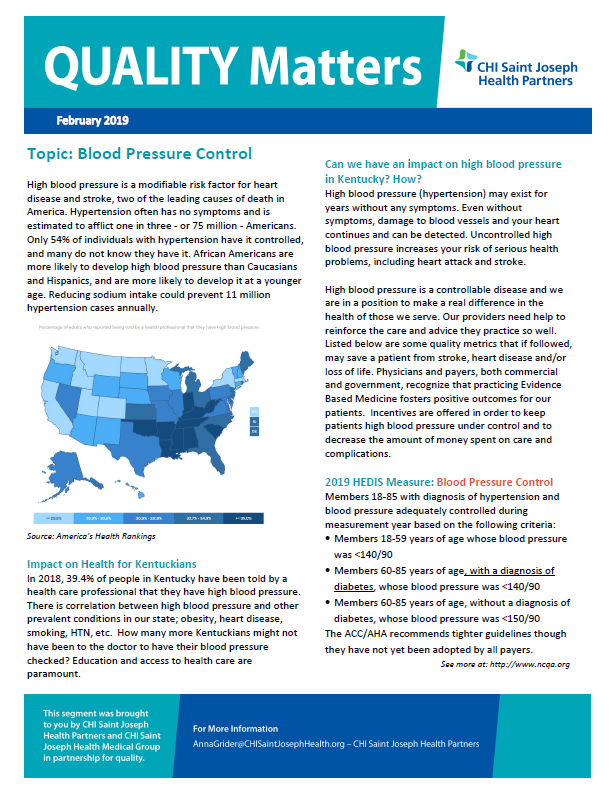 Quality Matters is a monthly publication distributed to providers through our CHI Saint Joseph Health Partners newsletter and housed on our website. Topics cover a range of age-related medical issues, from back to school well child visits to care for the elderly, and include information on how we can improve the health of Kentucky’s population. Documentation Tips are focused on improving provider documentation of quality metrics, primarily in a patient’s electronic health record.